When Gigabyte announced the Aero 15 with Core i9 CPU and RTX 2080 GPU options, we expressed our suspicion about potential throttling issues because of the thin form factor. Now that we have both the Gigabyte Aero 15 X9 and Razer Blade 15 with the same RTX 2070 Max-Q GPU between them, we can compare the two to see if there are any differences in GPU power. Right off the bat, we can see that the Gigabyte system is running its RTX 2070 Max-Q GPU at an 18 percent slower base clock rate than on the Razer Blade 15 (885 MHz vs. 1080 MHz) as shown by their respective GPU-Z screenshots below. The ramifications are observable through the 3DMark benchmarks below where the Blade 15 is able to outscore the Aero 15 X9 by double-digit percentage points in every single test including ray tracing. 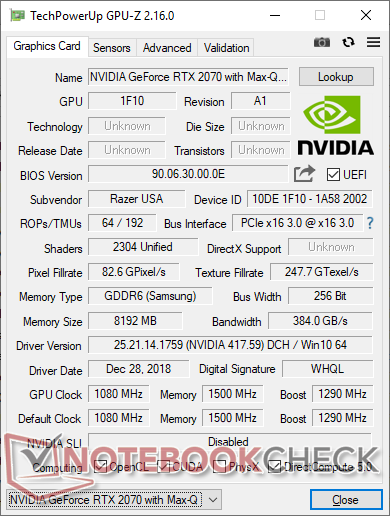 Does this mean that Gigabyte is underclocking its GPU? 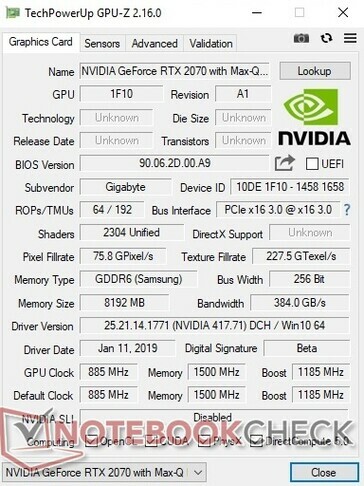 Not necessarily, because the official Nvidia spec sheet for the RTX 2070 Max-Q lists a base clock rate of only 885 MHz — the same as what we've discovered on the Aero 15 X9. 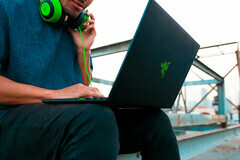 Instead, it's more like Razer has overclocked the GPU to give its Blade 15 that slight edge over the competition.